Anyone with an internet connection must find it impossible to ignore the existence of The Last of Us. Every major game blog seems to run a bi-weekly gush of the Naughty Dog game, and images of the character Ellie seem as ubiquitous online as hair gel in a project management meeting. So during a fit of “I’M WASTING MY LIFE BY NOT PLAYING ENOUGH GAMES” I ordered a copy of The Last of Us for my PlayStation 3. I played an hour or so with the Welshman then had to go out for some reason, and when I came back I’d missed some of the story so I put the game on the backburner to revisit when I could pay decent attention to it. 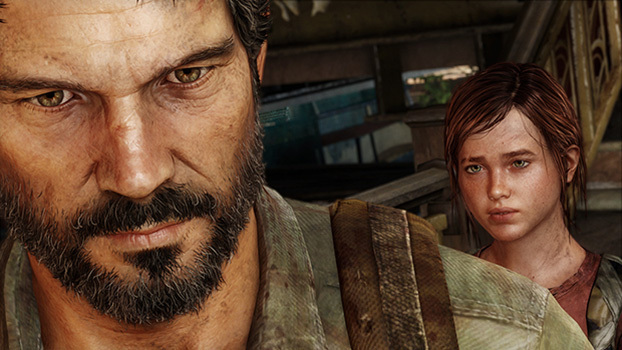 Because that’s one of the oft-heralded features of The Last of Us: the storyline. Apparently, it’s good. So good that a colleague who’d finished it wouldn’t tell me much about it because it’d give away too many spoilers, and she wanted me to experience it properly myself. When I had a few hours free earlier this week I began the game again. (Easy mode. You have to start somewhere.) I’d never played a third-person game on the PS3 so it took me a while to get the hang of the controls; I’m used to using a mouse and ESDF on a PC, and I find the PS3 Dualshock’s thumbstick-thingos hard to master. Just a slight movement would send my view off to the side and two seconds later, a monsterdude would be chomping on my neck. Slowing down the sensitivity helped a lot, and suddenly I was taking out soldiers with two shots instead of twenty. Occasionally I’d forget which controls did what (e.g. pick stuff up, vault, climb ladders) so I’d be mashing away at a button, my character grasping foolishly at a wall, while the other characters looked on. I could see the scorn in their eyes. I made it to just outside the city walls when I saved the game and put the controls down. For anyone who’s played it before: yeah, yeah, saving wasn’t necessary. I forgot it auto-saved, and thus I’ve filled up the memory with five saved increments of the same game. Genius. More gameplay is scheduled for the weekend. I’ll report back soon.